Pristine beaches and ecotourism adventures await travelers at the new Villa del Palmar Beach Resort and Spa at the Islands of Loreto, Mexico. Located in Baja California the resort offers 181 spacious suites (studios, one-, two- and three-bedroom villas as well as an Ambassador Suite, Royal Suite and Presidential four-bedroom Suites) with views of the sparkling Sea of Cortez. Future developments include tennis courts and a 35,000 square-foot state-of-the-art fitness center and spa, which will open summer of 2011. 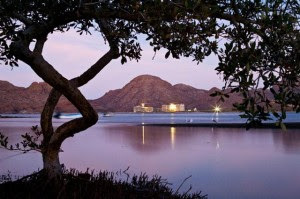 Villa del Palmar is the only five-star resort in the area and the first property in the Villa Group Resort’s planned 1,800-acre development in Loreto, “Danzante Bay,” which will include seven resort hotels, 240 home sites, additional restaurants and a Rees Jones golf course. Loreto was named the number eight destination to visit in a recent New York Times “Where to Go in 2011″ article. Just a 90-minute flight from Los Angeles, Calif., this ecological wonderland is home to one of the world’s largest marine parks and the oldest colonial town on the peninsula. The resort faces Danzante Island and is surrounded by the majestic Sierra de la Giganta Mountains. With the calm waters of the Sea of Cortez, a unique turtle-shaped pool and the largest Jacuzzi in the entire Baja California South, Villa del Palmar Beach Resort and Spa at the Islands of Loreto offers a variety of water activities including snorkeling, kayaking and scuba diving. The resort also offers ecological activities such as mountain hiking, climbing, camping and much more in the Bay of Loreto, home to close to 900 species of reef-dwelling and migratory fish. The Villa Group was founded in 1984 and is one of Mexico’s leading privately owned hotel, resort and real estate development companies. Its portfolio includes beachfront destination resorts, exclusive vacation ownership, and fractional and full ownership luxury real estate developments. We spent a week with an incredible atmosphere, great food, the fun well suited to all ages. Very clean hotel with great service from all the pesonal, our bellboy Antonio Martinez was excellent host. The only thing is you have to buy internet apart and does not work anywhere in the hotel, only in reception, for which they made the internet payment refund. Overall highly recommended, if you do not take teenagers, as the village is about 20 minutes drive. And if you do not bring car, especially in a taxi as it is located away from everything. The rooms very comfortable, just suggest changing pillows (very hard).